In our first Fire Prevention Week post we broke down the theme “Look. Listen. Learn.” and explained how to apply it to your home. In this article we want to specifically address the ways business owners and managers can apply these to the workplace. “Look” means being aware of the fire hazards in your building. This includes activities that can become hazardous, such as smoking or cooking. Each business will have specific needs, for example, a restaurant will have multiple cooking-related hazards while an office space will have more electrical things to consider. 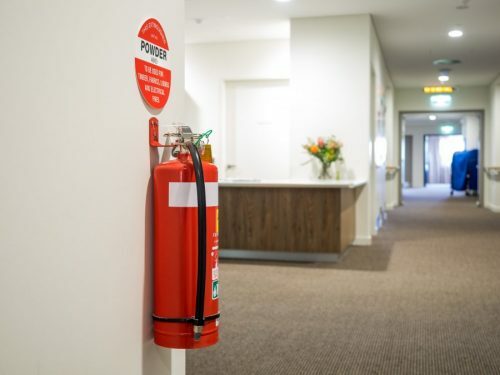 For each activity or specific concern, be sure the proper fire protection equipment is in place and that the code-compliant procedures are being followed. Restaurants will need their kitchen fire suppression systems to have sufficient coverage for their appliances, and will need regular hood cleaning to stay safe. Office spaces, especially those with many electronics, will want to have fire suppression systems made specifically for data centers. If a place of business knows that the employees will be taking smoke breaks near or inside the building, it is important to establish designated areas for that activity with suitable receptacles for the disposal of cigarettes. “Listen” reminds owners that it is important for a business to have a smoke alarm system in place that is kept up to date and tested regularly. In a large space, it is often required that the smoke alarm system be interconnected and automatically place an emergency call to the fire department should smoke be detected. It is a good practice to involve your employees in a safety demonstration while the fire safety specialist performs the fire alarm test so that your staff knows what the alarm sounds like. This also creates the perfect opportunity to review your office escape plan, which falls under the third category, “Learn”. “Learn” addresses the need for a fire escape plan with more than one escape route designated and reminds the public of the need to review this plan regularly. Business owners can create a regular schedule for reviewing the escape plan with employees, say quarterly or semi-annually, based on how frequently new members join the team. They can also be sure to have copies of the fire escape plan posted around the building at regular intervals in obvious locations, such as the hotel practice of posting the escape routes on inside of the door of each room. Having your exit and emergency lights checked regularly by a professional is another way to keep exits clearly marked for staff and customers. When it comes to fire-related emergencies, homes are not the only places at risk. By putting these simple principles in place at your office, you protect the lives of your employees as well as your investment in your business space. If you are unsure of how to apply these safety precautions to your unique situation, give us a call to schedule a free consultation today.